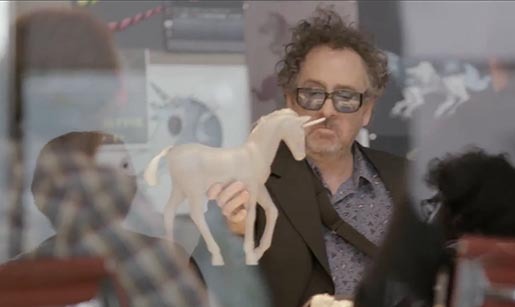 Samsung is running “Unicorn Apocalypse”, a series of commercials in which a games company develops a mobile gaming environment featuring zombie unicorns, works with film director Tim Burton, and integrates Samsung mobile phone technology. Launched in January 2013, the campaign took a leap forward with “Meeting with Tim Burton” aired during the Oscars ceremony broadcast. The Company gets a little help from the Galaxy Note II with SAFE technology in making Unicorn Apocalypse come to life. Play Hard. Work Safe. Did Unicorn Apocalypse get leaked to the public? If only every phone could be as safe and secure as the Galaxy S III and the Galaxy Note II. If only. Unicorn Apocalypse is coming. Watch how the company uses Group Play to play hard, but work SAFE. Why have two phones, when you could have one? Unicorn Apocalypse + Tim Burton = Awesome. The company finds out Unicorn Apocalypse is being made into a movie, and Tim Burton grabs a Galaxy Note 10.1 to show the team his vision. The Unicorn Apocalypse campaign was developed at 72andSunny by CEO John Boiler, executive creative director Jason Norcross, creative directors Matt Heath and Barton Corley, senior designer Allison Hayes, copywriter Jack Jensen, director of film production Sam Baerwald, senior film producers Angelo Mazzamuto and Erin Goodsell. Filming was shot by director Michael Downing via Epoch Films with executive producer Jerry Solomon and John Duffin, producer Eric Sedorovitz, and director of photography Darko Suvak. Editor was Will Hasell at Arcade Edit with managing partner Damian Stevens, executive producer Nicole Visram, producer Kirsten Thon-Webb and assistant editor Luc Giddens. Visual effects were produced at The Mission Studio. Telecine was produced at The Mill, Los Angeles. Music was produced at South Music. Sound was designed at Barking Owl and mixed at Play.